I read this article and found it very interesting, thought it might be something for you. The article is called Maharashtra Govt Accepts All Major Demands, After Farmers Flood Mumbai and is located at https://archive.indiaspend.com/cover-story/maharashtra-govt-accepts-all-major-demands-after-farmers-flood-mumbai-80216. Mumbai: Faced with a public-relations crisis, the government of India’s richest state accepted four major demands made by thousands of farmers, after they flooded in to Mumbai on March 12, 2018. 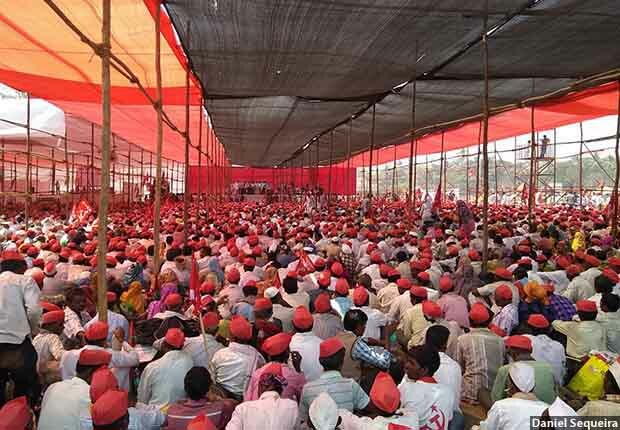 A seven-day, 180-km march of 35,000 mostly poor farmers in India’s richest state finally attracted nationwide attention when they reached the country’s financial capital to bring their problems to the attention of Maharashtra chief minister Devendra Fadnavis. They marched for four distinct reasons: land rights to those who have tilled forest land for several years; better minimum prices from the government for agricultural produce and better security against the vagaries of the monsoons; pensions for agricultural labour, still considered a part of the informal sector; proper implementation of farm-loan waivers that the government promised; and for relief from the economic losses of 2016’s demonetisation decision. As the march made national headlines, the government announced by the evening of March 12, 2018, that it would accept demands related to expanding the eligibility of the farm-loan waiver announced in 2017, quicker transfer of land titles under the Forest Rights Act, 2006, and increasing pensions to agricultural labourers, from Rs 500 to Rs 1,000 per month. From over 135 villages across Maharashtra, the farmers began their journey on foot from CBS Chowk in the northern city of Nashik on March 5, 2018. Organised by the Akhil Bharatiya Kisan Sabha (All Indian Farmers’, affiliated to the Communist Party of India-Marxist, the farmers arrived at the Thane-Mulund toll naka on the north-eastern border of Mumbai on Sunday afternoon, March 11, 2018. Much of their simple footwear–slippers and sandals–fell apart. Some left families behind, others, especially the older ones, walked even though they struggled to keep up, and cooked food and slept where they could. They walked 30 km every day, sleeping on roadsides, and eating food cooked on wood fires along the way. To avoid inconveniencing students appearing for their exams and citizens commuting to work, the farmers walked the last leg of their journey overnight, reaching Azad Maidan in South Mumbai on Monday, March 12, 2018. Maharashtra’s agricultural sector is set to decline 8.3% this year due to deficient rain and despite several irrigation projects, currently only 18% of farmland in the state is irrigated, shows the Maharashtra Economic Survey 2018. Maharashtra’s agrarian crisis is common to farmers nationwide, many of whom are steeped in a cycle of low returns, debt–and, often, death–in an age of increasingly uncertain weather. Over a year to June 2013, 70% Indian farm families spent more than they earned, over 52% were indebted and health costs were adding to their debt, as IndiaSpend reported on June 27, 2017. In five years to 2015-16, real farm income per cultivator increased only 0.44% per year, we reported. Climate change could slash India’s farm income by up to 25%, warned the Economic Survey 2018. Uncertain weather affects the ability of government extension systems to provide accurate advice to farmers, IndiaSpend reported on June 8, 2017. For example, while Maharashtra received plentiful rains in 2016, mitigating the droughts of 2014 and 2015, many parts of the state also endured floods that year. Further, the rural economy has yet to recover from a cash crunch induced by demonetisation.. A year after Prime Minister Narendra Modi pulled out of circulation 86% of India’s currency, largely held in Rs 500 and Rs 1,000 notes, farmers in Nashik reported cheques still took weeks to encash, leaving them without money when they needed it most, as IndiaSpend reported on November 4, 2017. As district cooperative banks, which over 70% of India’s onion belt depends on, are still to recover from demonetisation, farmers struggle to access credit,, we reported on November 11, 2017. Kamli Babu has already submitted her forms for pension with the Tehsildar more than 2 yrs ago but is yet to receive word from the government. They have now walked from Nashik to Azad Maidan, covering a distance of 180kms, to demand ownership of the forest land under the forest rights act. "We have been protesting for this since 2010. We've even gone to Delhi for this. Walking for so long is not a big deal." "We need land ownership to protect our rights. At any point the govt can claim this land is forest and come take it away from us. What happens to the 50 years we have worked here?" "We have Aadhaar cards but we still don't get rations as we are yet to get our Below Poverty Line ration card. Earlier we used to 10 kgs but now we get only 5 kgs of ration," said farmer Walamba. "They refuse to recognize our poverty is seasonal & linked to the monsoons."